When I planted a Clematis ‘Gravetye Beauty’ at The Priory, I had no idea what or who it was named after. 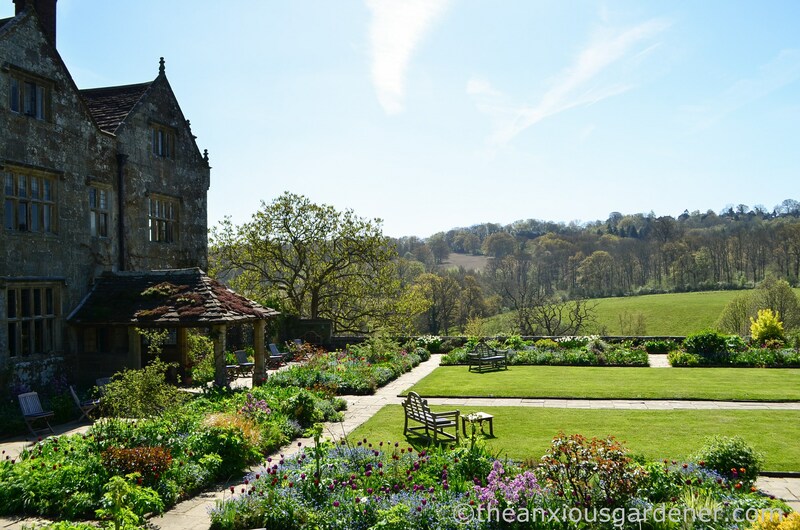 And then in August a blogging friend, Sara, wrote about a visit to Gravetye Manor and the penny dropped (you can read her post – here). Sara’s description and photos were captivating and I wished I could go too. 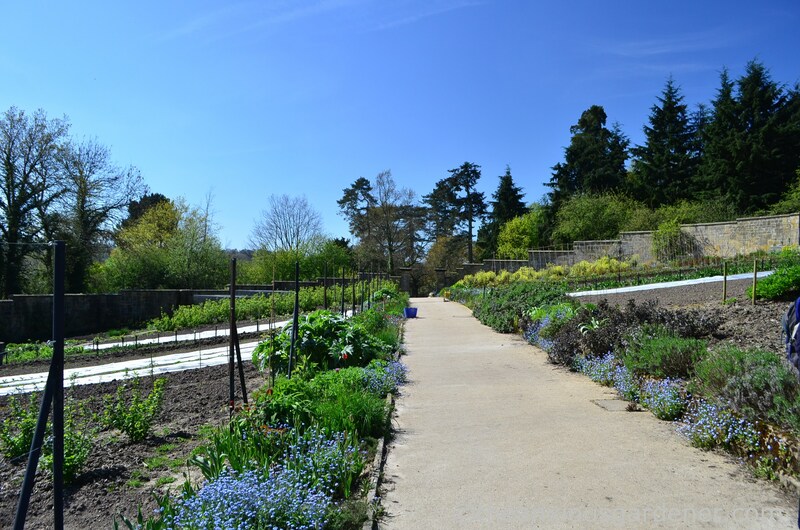 So, when I received an email out of the blue inviting me to lunch at Gravetye and a guided tour by the head gardener, my acceptance was immediate, my haste unseemly. The Tudor house dates from 1598 and is now a hotel and restaurant. But for 50 years, until his death in 1935, it was the home of William Robinson. Robinson is little known today – which is puzzling as he was hugely influential on modern gardening and helped introduce ‘natural’ planting and the informal cottage garden. He disliked regimented bedding, topiary, statuary and the staid, formality of the high Victorian garden. In their place he advocated wild flower meadows, naturalistic planting, bulbs under trees, alpines in rockeries and the mixed herbaceous border. The gardens today are a testament to Robinson’s meticulous planning and vision. But for many years after his death, the house and grounds fell into neglect and the current owners have carried out a huge amount of work (and spent a huge amount of money) on restoring both. 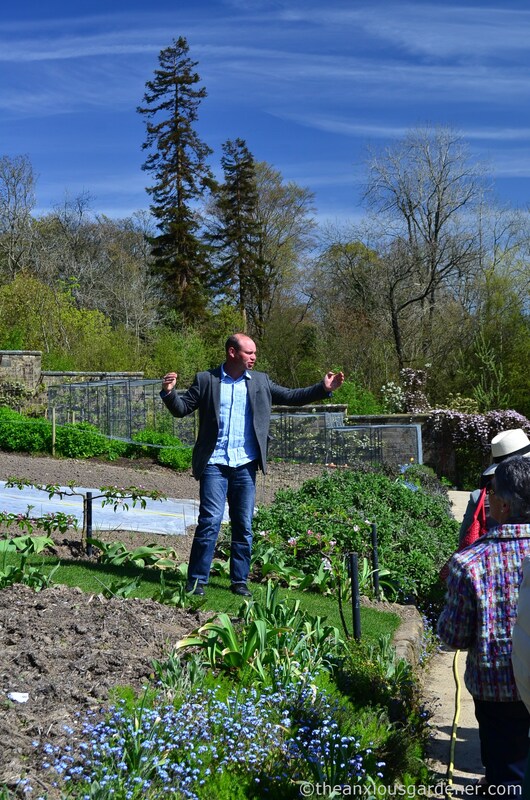 On arrival, and after coffee, I joined a largish group for the garden tour by Tom Coward. Tom trained under Fergus Garrett at Great Dixter and has been head gardener at Gravetye for four years. He has a team of under-gardeners, students and volunteers to help him in restoring and tending the grounds. 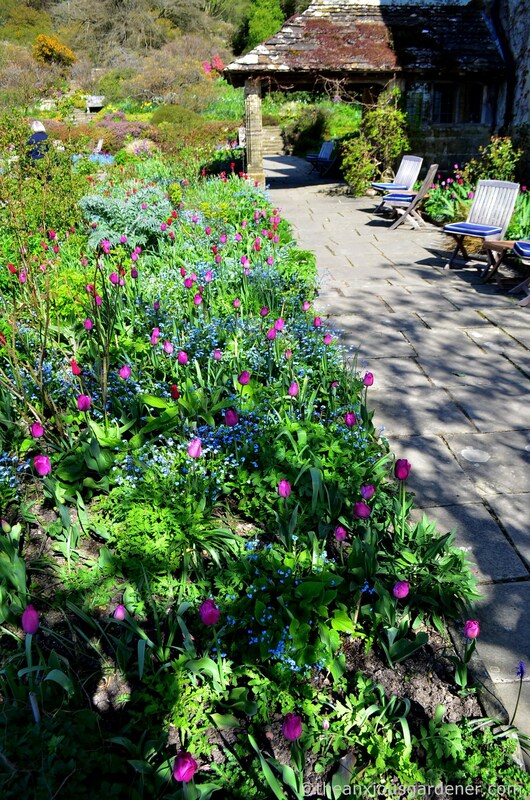 On a perfect spring morning, the Flower Garden on the west side of the house was packed with expectation and realisation – and, irritatingly, put my borders to shame. The tulips were at their peak but whilst Tulip ‘Red Shine’ did indeed shine, Tom told us that hundreds of an orange variety (from a particular supplier – who he won’t be using again) failed to flower. However the resources he has to hand are astounding: he had enough flowering tulips in reserve to fill all the gaps. 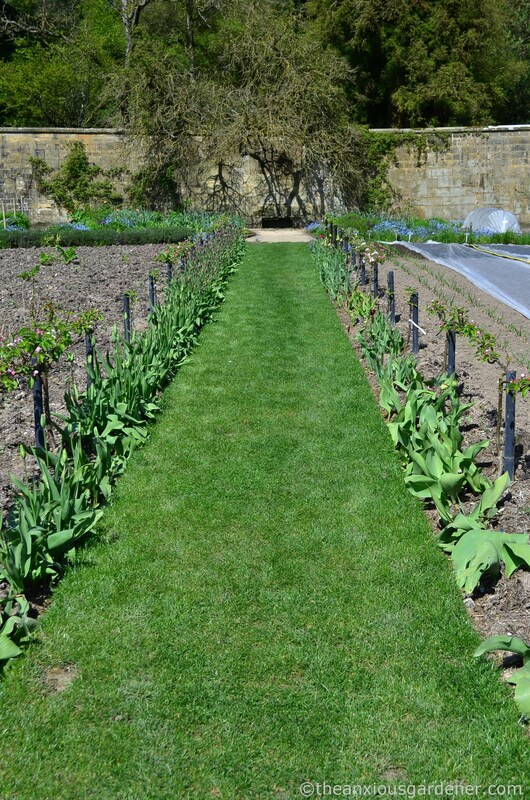 Imagine being able to plant up an area this size (far, far larger than most domestic gardens) with sufficient ‘backup’ tulips which you just happen to have spare. (I think the ‘spare’ tulips were meant to provide the house with cut flowers). 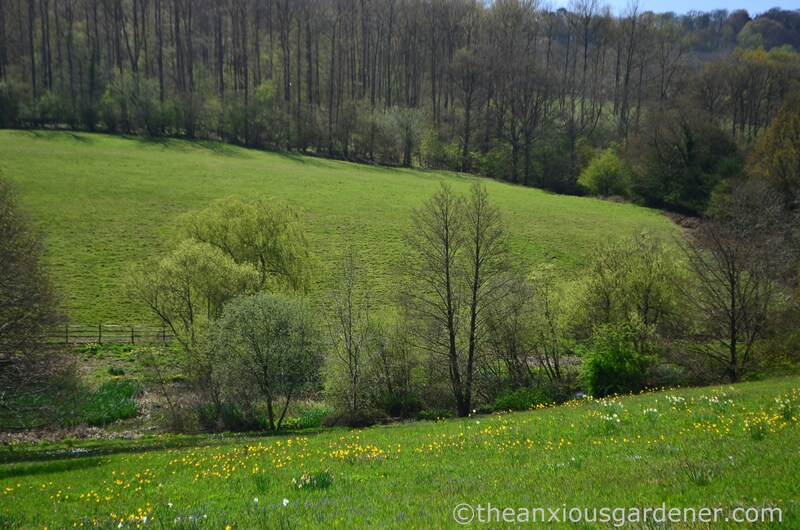 Sloping away from the house to the south is a large wildflower meadow. I suppose this is a grand-daddy of all wildflower meadows: I don’t know whether this was the first but the concept of a meadow within a garden was highly unusual. Until Robinson created this one. The daffodils were over and the soft haze of yellow above is Tulipa sylvestris. (I must buy some). Meadow management is similar to that at The Priory. Cut once a year in late summer and with the mowings removed, it was interesting that they then introduce a flock of sheep to graze for several weeks. I had thought this a no-no: introducing unwanted sheep ‘fertiliser’ to a nutrient sparse soil. But Tom explained that so long as the sheep are not fed anything other than what they graze, they are removing nutrients and further reducing soil fertility; even if they are manuring the ground. Though today’s Gravetye is very faithful to Robinson, the gardens aren’t set in aspic. 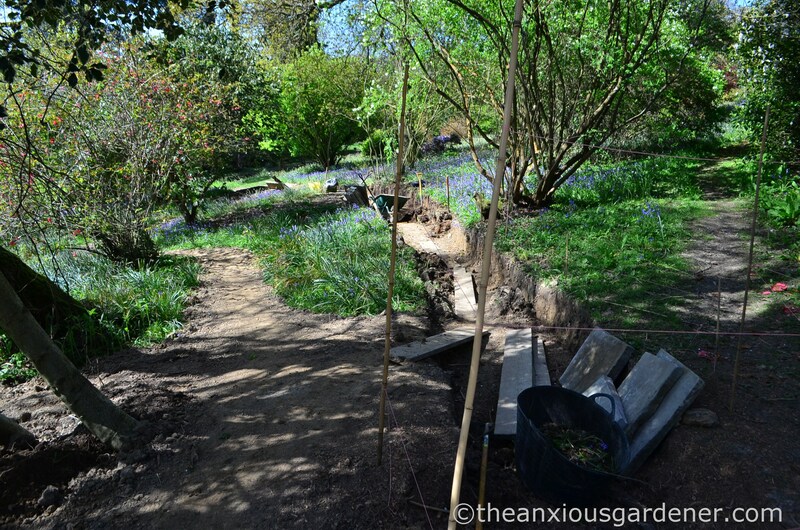 A long, new pathway and steps will provide easier, more fluid progression through the Wild Garden. Robinson didn’t always get it right. 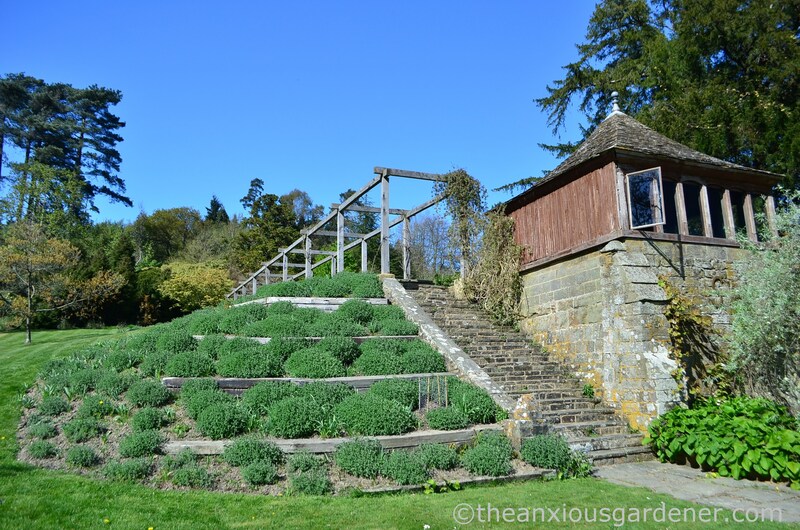 At the top of the slope above the house, sits an oval, walled kitchen-garden. It is enormous. Really. I haven’t seen one on this scale since Heligan. step-over apple trees; fruit cages; asparagus and strawberry beds. Tom is an accomplished, witty and engaging guide – and, of course, a very knowledgeable, skilled gardener. Nonetheless, I liked him. But I wouldn’t want to shoulder his responsibility. 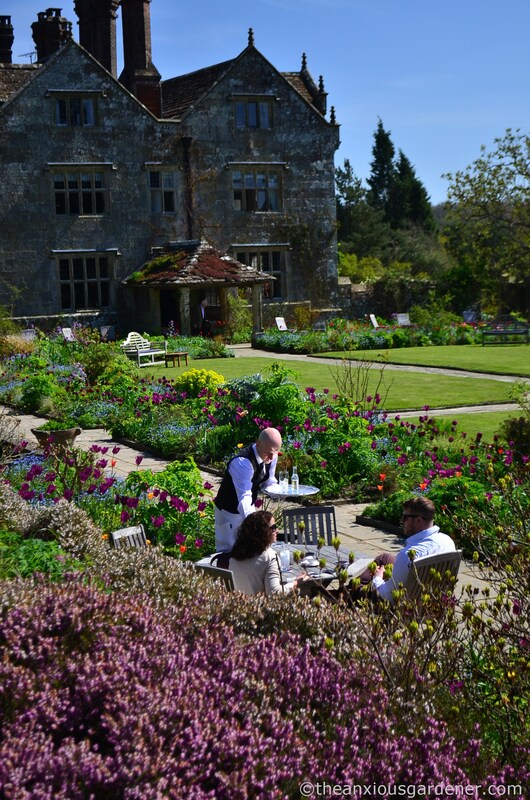 Not only must he ensure that the gardens look superb for hotel guests, diners and day-trippers; not only must he manage a highly regarded historic garden; supervise a large team; guide tours and write the Gravetye blog; he also supplies the kitchens with quality produce. And very specific produce at that: golden beetroot no larger than a golf ball; young carrots the size of your finger. He grows what the kitchen demands. There is a polytunnel and several greenhouses growing tender perennials and fruit. 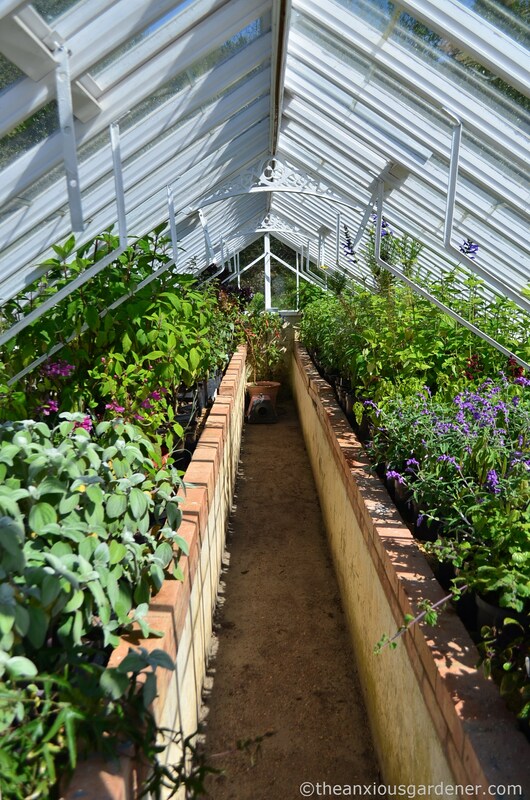 Once again there is ample evidence of money being invested in the gardens: the glasshouses have all been renovated or rebuilt. As have these glorious, wonderfully engineered cold-frames. You’re jealous aren’t you? After a couple of hours we drifted back to the house for a glass of wine on the terrace, followed by a three course lunch. The soup was an earthy wild garlic, potato, hazelnut and goat’s cheese bowl of loveliness; followed by a main course of roast chicken breast, mustard and herb pomme purée, with asparagus in a madeira jus. It was all delicious if, thanks to modern fashion, small portioned. The piped purée was barely visible below the two nuggets of chicken. Dessert of yoghurt and buttermilk panna cotta, with slightly crunchy rhubarb, crumbled gingerbread and sorrel topping was fantastic … but served in a slim, three-inch high glass. I’d barely started before I’d finished. I’m afraid that after (mentally) licking my plate, I wasn’t by any means full. And I wasn’t alone on lamenting the portion sizes. (Whispered, obviously). Undoubtedly the lunch was a joy to look at, to smell and taste but … erm, shouldn’t it have filled me up too? Oh well. I am just a hungry, jobbing gardener out on a freebie. What do I know about fine dining and posh restaurants? I have no complaint whatsoever about the service. I was particularly impressed when a perfect circle of waiting staff appeared silently and unobtrusively around our table and, at a nod from one, glided in and lifted away our empty plates in a beautifully choreographed sweep. I wanted to applaud and maybe, unwittingly, I did. and these stepped tiers of nepeta will be marvellous in flower. 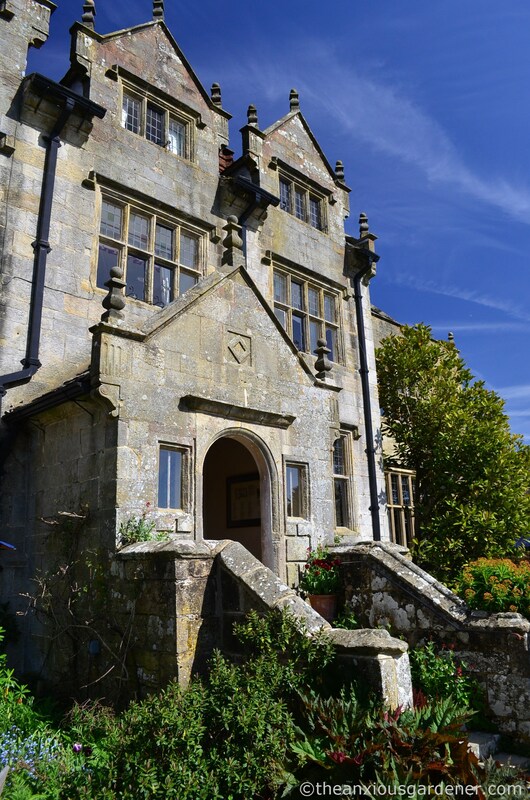 If you’d like to visit Gravetye , you’ll find all the information you need on their website. (The gardens are only open to non-guests on Tuesdays and Fridays). And if you go, do look out for me. I’ll be the one scribbling furiously in a notebook and nicking lots of ideas. *Before lunch, I chatted to Stephen, a fellow guest, who works in a garden similar to The Priory. One day, whilst tending his vegetable garden, a very elderly, retired gardener stopped by. Stephen was proud of his efforts and hoped to impress the old-timer with his neat rows of carrots and leeks, beans and potatoes. For some time, the old man looked impassively and wordlessly at the beds in front of him and then, finally, he pointed with his walking stick, “Dandelion there”. On the subject of the food, I love veg and to only get a tiny squirt of something like parsnip purée or a few tiny squares of roast beetroot, after all the trouble of preparing it, is very disappointing! Aren’t we supposed to eat more veg? I now want to visit! Thank you for the virtual tour. There are so many amazing gardens in the UK – and amazing gardeners. Popping over to check out the link and plan a visit. William Robinson sounds like my kind of gardener but I’ve never heard of him either. 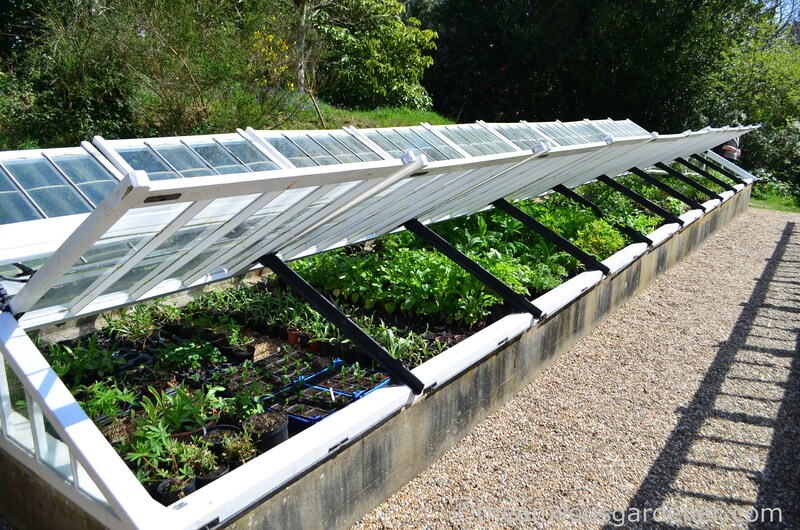 Those cold frames are something to be a bit jealous over aren’t they? I wouldn’t mind having one or two. I wonder if they open automatically if it gets too hot inside. This is a beautiful place but to be honest I’m glad it isn’t me who has to care for it all and grow vegetables besides. I can see dawn to dark, seven days per week. Just about the same hours I used to work as a gardener, come to think of it. Disappointed to hear that your side order of chips n’ onion rings didn’t appear though. Oh to have ‘spare’ tulips waiting in the wings but yes, the pressure. It’s stressful having to deliver plants for photo shoots but to have that every day. It might take some of the pleasure out of the gardening. Thanks for giving us hope, it’s good to know even rarefied places like Gravetye have weeds. 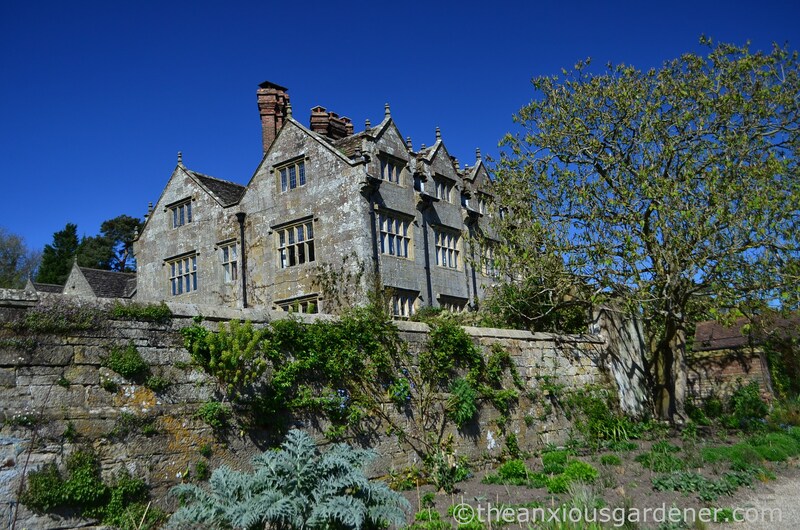 Gravetye is one of my bucket list gardens that I’ll visit one day although I think the house looks very forbidding, I’m not sure I’d want to stay there. Your description of the food made me laugh, just like masterchef – and then to read the portions were miniscule, poor you! 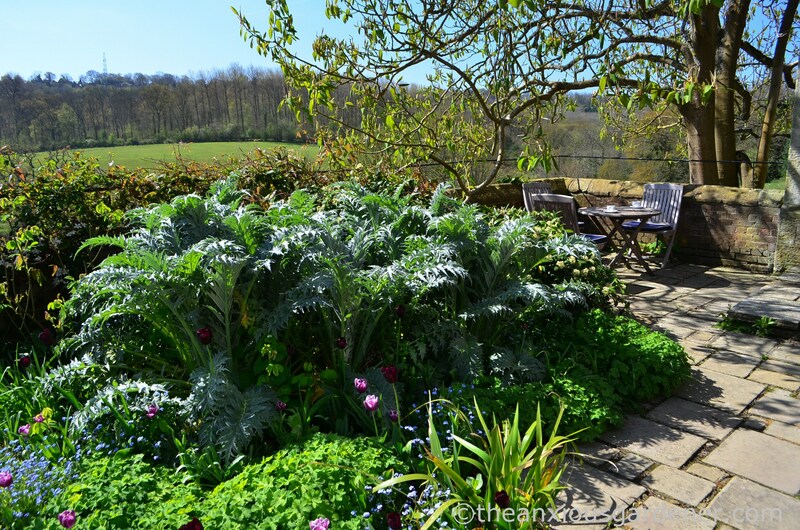 Interesting to read that the gardens are inspired by Dixter, I thought they looked very similar but with neater lawns! (and better cold frames). 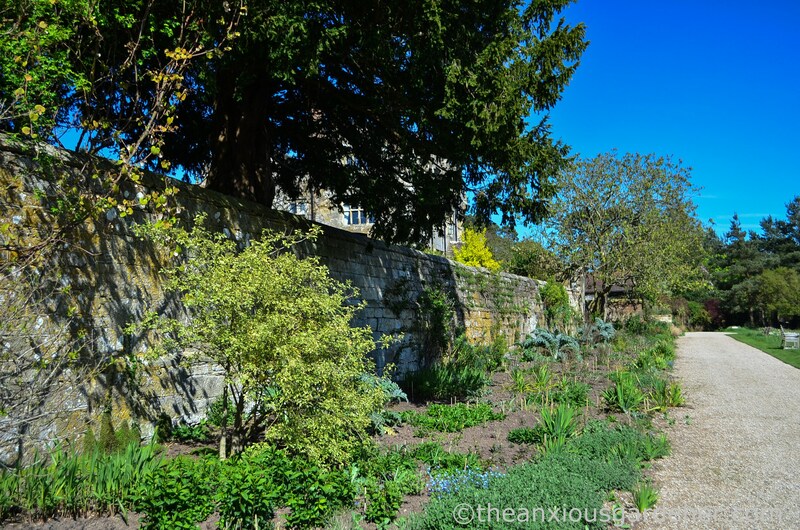 Lovely post but I agree with Janet, I thoroughly enjoy your glimpses of The Priory – made all the more special because you achieve it all without the help of minions! 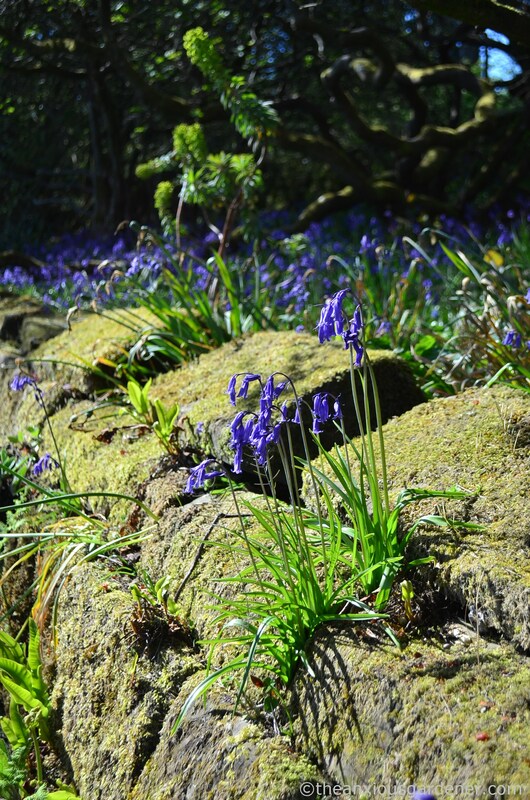 What a fabulous opportunity to visit the gardens and see their spring displays, and perfect weather for it. I too love the thought of spare tulips in those numbers! Sounds as though Gravetye captured your heart just as it caught mine – I’m glad that you loved it so much. 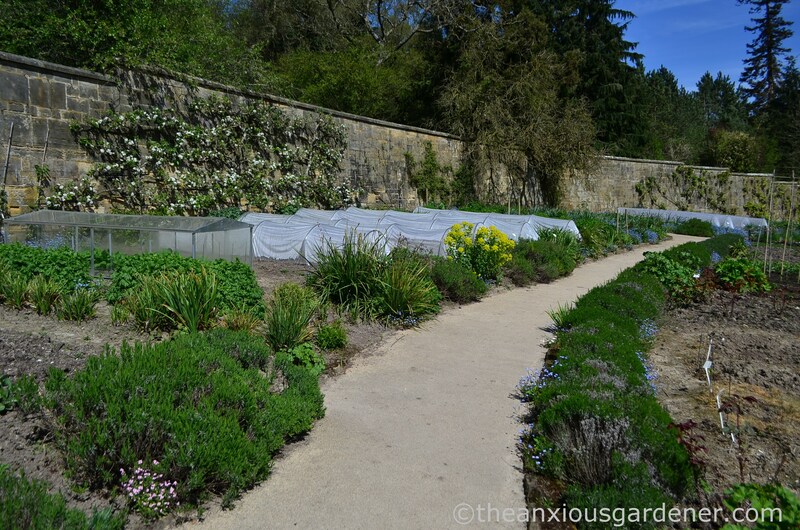 Don’t you have ‘walled-kitchen-garden-envy’ now? I don’t remember any complaints about the portion size, but perhaps we were lucky with our choices! The food was certainly enjoyable. Lucky you. Trip Advisor also complains about the small portions. I wonder who the bulb supplier was, I hope not PN My garden in North Yorkshire is just beginning to get into its stride.and the veg garden is just taking off. We are so much later than you lot down South. How fantastic to be invited for lunch there. I’ve read quite a bit about the garden, it would be marvellous to actually get to visit! What a shame the lunch didn’t match up to the garden, it sounded good. but if you left feeling hungry, then it didn’t succeed did it! Keep that old man away from my garden. Many “dandelions there”! Sounds like you had a great time touring the place, with its more relaxed and yet immaculate approach to planting. The place does look splendid and a testament on its own how well the head gardener and his crew are managing the place. Be still my beating heart – what a wonderful place – I am drooling. This is gorgeous how wonderful to have an in-depth tour, I have recently been reading about Robinson and would love to visit. Great post and lovely photos. Thank you Janet very much. I often struggle to eye the Priory objectively – so your comment really means something to me (I’m filling up). I do wonder what I might achieve with a large team of helpers! 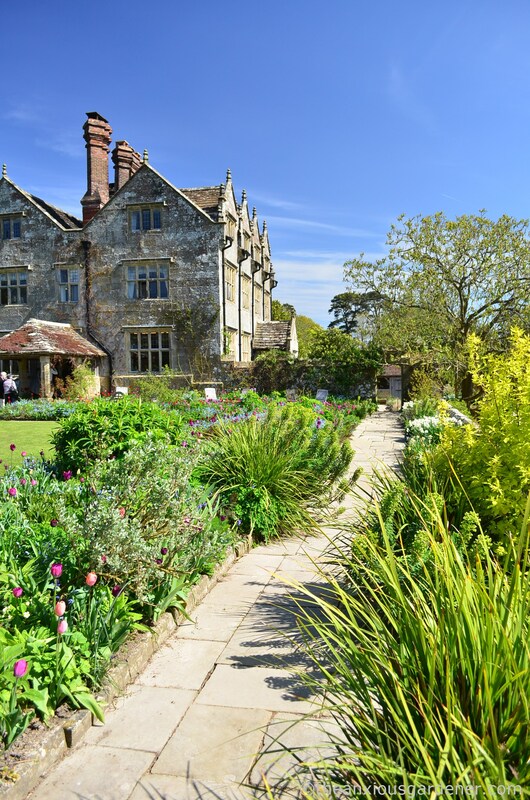 Oh, I must put Gravetye Manor on my wish list! Absolutely beautiful place! Somewhere I’d love to visit. Lucky you! Indeed Christina. I did feel very lucky – it was a grand day out. Just to know that there are people in this world who have backup tulips… How lovely is that?! I love how a garden feels home-y the minute you find a weed in it. I actually waded into one of the beds at the Botanic Gardens the other day to pull up some bindweed before realizing where I was. Fortunately no one was around and I could get rid of my fistful of weeds behind a bush before anyone saw. Speaking of sheep, are the sheep next door about to have their dreams of grazing on Priory land come true? That is so sweet, Stacy. I can so imagine you rummaging about in some public border without even realising what you are doing. Personally, if I’d seen you, I would have tutted and whispered disparaging remarks to my companion. Obviously, I too have hundreds of tulips in reserve – just in case. Do you not? Wonderful post…photos to drool over and another tick on my ‘to visit ‘list, thanks.